The “doctor knows best” mentality has been a cornerstone of medicine and dentistry. But over the last decade, with the advent of the Internet, families are becoming more informed about their healthcare. Although I do, occasionally, get patients coming in and presenting me with some crazy ideas found on some less than reputable websites, people are, for the most part, benefiting from the resources out there, and I welcome more involvement of patients in the decision making process. After all, I only see a patient twice a year for checkups and a lot can happen in the six months in between. So how can you take an active role, and make your home a positive place for your family’s dental health? 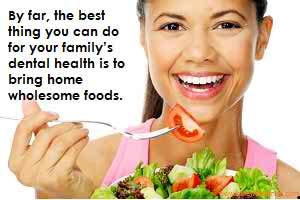 By far, the best thing you can do for your family’s dental health is to bring home wholesome foods. Avoid processed foods and carbohydrates. Thankfully, over the past decade our entire culture has gotten more “carb conscious.” There are so many alternatives out there now, compared to when I was growing up. Fresh fruits and vegetables are a great substitute for a snack that, in the past, may have been made up of cookies and potato chips. Beyond the typical high carb snacks, there are the problems of pop and juice. As I’ve mentioned in my previous columns, juice may have natural sugar, as opposed to artificial sugar, but that doesn’t mean it’s not doing damage to your teeth. When kids admit to me that they drink pop, I always delve deeper I ask them, “What kind of pop do you drink?” Any guess as to the most common response? – “Whatever my mom (or dad) brings home.” Like it or not, parents are the gatekeepers for most of the junk that comes into the house. This may mean sacrificing our own indulgent habits for the sake of our family. You can’t always control what your kids eat and drink outside your home, but you can definitely keep a handle on what they’re consuming under your roof. Our patients love to get that goodie bag at the end of their cleaning appointment. They get a new toothbrush, toothpaste, floss, and anything else we can throw in there to get them excited about their oral hygiene (no easy task). Sadly, when the floss runs out, many of them will not go out and buy more, they just wait until their next cleaning. Sometimes, the same can be said about their toothbrush. Please, please, buy extra toothpaste, toothbrushes and floss and have them stocked in your home. The reason you stop flossing should not be, “I ran out of floss.” Change your toothbrush regularly. Everyone brushes with a different level of intensity, but you should be changing your toothbrush at the first sign of bent bristles, which, on average, is about every 3-4 months. If you have had a history of gum disease, or space between your teeth, an interdental brush or proxy brush is an essential tool. Think of it as a toothpick with bristles. If someone in the family has braces or fixed bridges, make sure you have plenty of floss holders or superfloss, so you can thread the fl under and clean out any trapped food. It goes without saying that the healthiest thing you can drink is water. The question is where are you getting your water from? Is it fluoridated? Most bottled water is not fluoridated, which can be a real problem. Communities in the United States without water fluoridation systems have been shown to have a higher risk of cavities. If you get your water from a municipal water source, then the chances are the water has fluoride in it and you should be just fine. If you have well water, then you should have your water tested to find out the mineral content. Even if your water is fluoridated, there are some home water filtration systems that will actually remove the fluoride along with other minerals from your drinking water. Bottom line, supplementing with a fluoride mouthwash once daily is a great adjunct to the minimal amounts of fluoride you may be getting in your daily water supply. This added boost can go a long way toward strengthening your enamel and fighting off tooth decay. Keep the environment in your home conducive to good dental health, and your family’s smiles will shine for years to come!